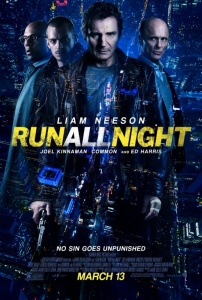 Anyone as disappointed as we were with Taken 3, the only other Liam Neeson movie so far in 2015, can rest assured that Run All Night is a far superior movie. In fact, it may be a better Taken sequel than, well, any of the Taken sequels. However, don’t go in expecting an entirely different movie, either; just one that has some of the familiar beats, but executed in a much more entertaining and, surprisingly, emotional manner. As with Neeson’s breakout action franchise, there are some sinister forces which threaten his family and Neeson has to go the limit in order to protect them; you know it well, we know it well, anyone who watched Taken and its inferior sequels knows it well, it’s nothing particularly new. That being said, director Jaume Collet-Serra – reuniting with Neeson for a third time after Unknown and Non-Stop – does at least attempt to up the dramatic stakes with this film; instead of a former CIA agent, Neeson plays an alcoholic criminal with strong personal ties to Ed Harris’ mob leader Shawn Maguire (okay, EastEnders fans, get it all out of your system), and any remaining ties to family, particularly estranged son Michael (Joel Kinnaman), have been irrevocably damaged before the film even begins. Neeson here plays something closer to A Walk Among The Tombstones’ Matthew Scudder than Taken’s Bryan Mills, and though Tombstones is probably a better movie than Run All Night it’s good to see Neeson being given this sort of character by Collet-Serra that’s more interesting and thus more engaging than Mills ever was. As watchable and entertaining as Neeson is here, as usual, it’s Ed Harris that carries the more emotional scenes of the movie with a shocking amount of restraint. The scene in which Neeson calls to inform him that his son Danny (Boyd Holbrook) has been shot by none other than him, in order to prevent him from shooting Michael, is actually very heart-breaking and solemnly played. Though he may be the big bad in all of this, the scene reminds us that he’s still just a guy who’s lost his only son forever, and it’s a testament to Harris’ performance in this scene that we feel bad for the character we’re meant to really be rooting against. Harris has been an underrated and at times underused character actor, and though this isn’t the most complex or even well-written character he’s ever played he still doesn’t deliver something half-baked and really puts the effort into his performance here. Unfortunately, much of the film rests on the shoulders of Kinnaman who we have now discovered, especially after headlining last year’s ill-advised Robocop remake, just doesn’t do anything for us, regardless of who’s directing him. The guy just doesn’t have the charisma to lead a movie, let alone an action movie, and since his character’s a rather ungrateful sod – no matter how many times Neeson saves him from certain death, he still has that utter disdain for his estranged daddy due to his criminal past – he’s hard to root for anyway. We should note that we’re making this judgement based on what we’ve seen in his film roles, keep in mind we haven’t seen him in TV’s The Killing where we hear he’s slightly better, but from what we’ve seen he’s the only element we’re worried about with next year’s Suicide Squad. The real star of the movie, however, is the action. Collet-Serra certainly knows how to craft an action scene, whether it’s an intense car chase or a scrap in a toilet cubicle or even in an ablaze apartment building. It’s gritty, it’s bloody, and it’s highly entertaining to watch for anyone just wanting a bit of Friday night escapism. Although some of Collet-Serra’s stylistic choices are a tad strange, such as whenever it turns into Google Maps when transitioning to other parts of the city, everything else is fun to watch as it gloriously soaks in all its silliness. If you had to see a Taken movie this year, make sure it’s Run All Night and not the actual Taken movie. Run All Night may not be the most original action film of Liam Neeson’s career, but thanks to entertaining action and strong emotional performances from Neeson and Ed Harris, it’s a daft bit of fun at best.